Fruit and barbecue are certainly no strangers, from the fruit woods in the cooker to the extensive garnishes used at MBN contests. But berries are not as often seen. That didn't stop exotic local food guru Charlie Tambellini from combining smokey barbecue tomato-based sauce with the sweet, sultry flavor of ripe blackberry. Tambellini's culinary startup, Further Foods, specializes in providing the flavorfully exotic and unique. The company offers a variety of sauces, spices, and other foodstuffs. Admittedly, I was a little bit skeptical about how well blackberry would work in a barbecue sauce. But the first taste sold me. The blackberry flavor is more sweet than tart and blends seamlessly with the more traditional taste of sweet tomato-based sauce. It's more than just a complementary flavor, but it doesn't dominate either. 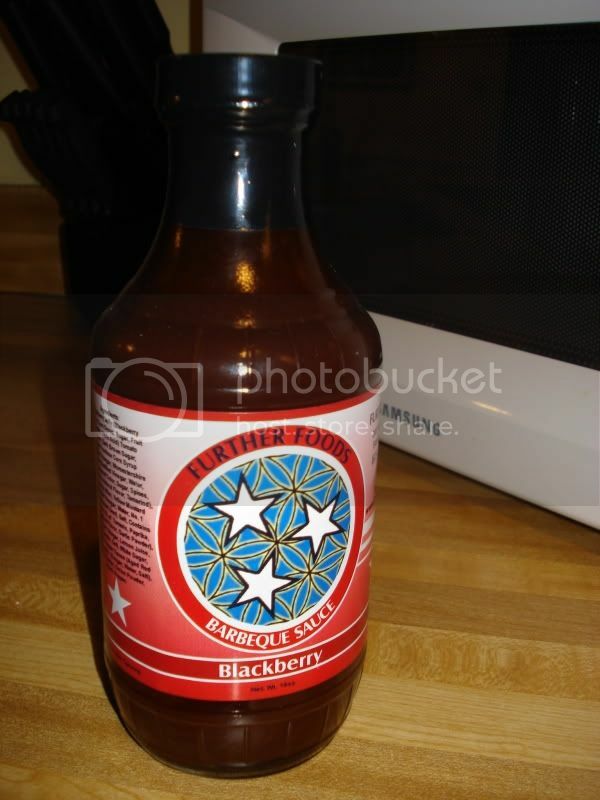 Overall, it's very sweet, tempered by a little bit of tanginess and smokiness. Howdy! It's been awhile since I've checked in here. Life has been crazy, but spring is here, smoke is in the air, and I'm ready to reengage. And what better way to reengage than with a trip to the greatest barbecue mecca in the world? You may remember Memphis from such past Ulika reports as this one or this one or this one. 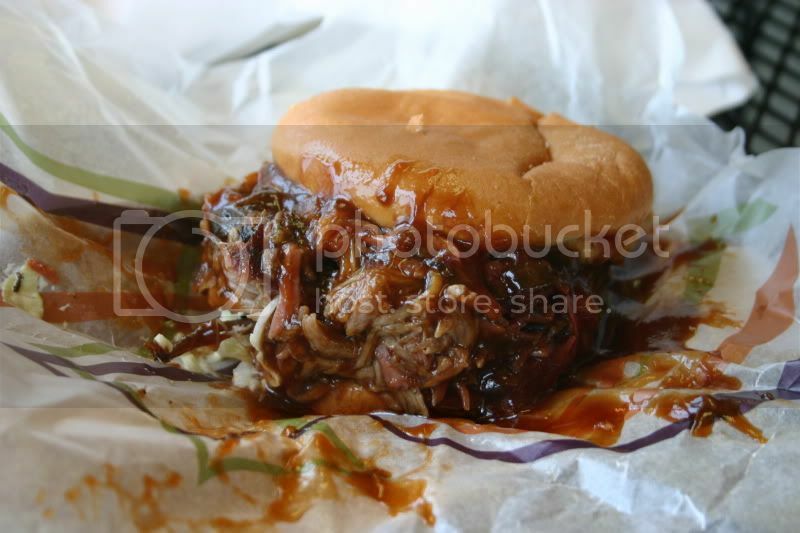 We've covered the famous and the not-so-famous, but with over 50 listed barbecue restaurants within the Memphis city limits, we've just seen the tip of the iceburg. The weather was nice, and I hadn't been to the Bluff City in a while, so I put on my Tiger Basketball t-shirt, grabbed some good music, and headed west. 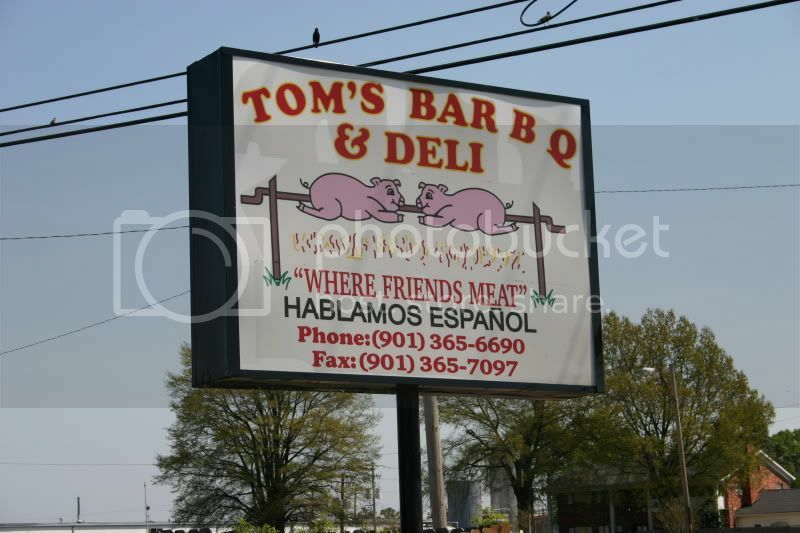 The first stop was Tom's Bar-B-Q and Deli. 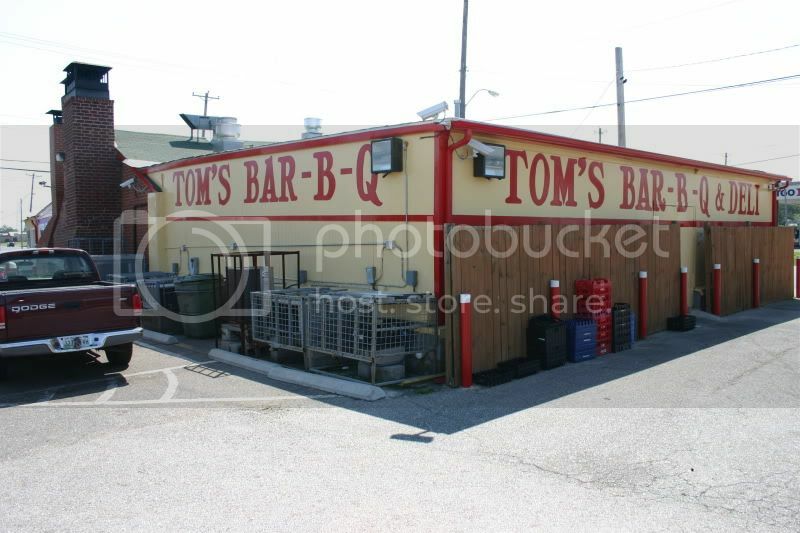 Tom's is southeast of downtown, not far from the airport, in a very industrial part of the city. 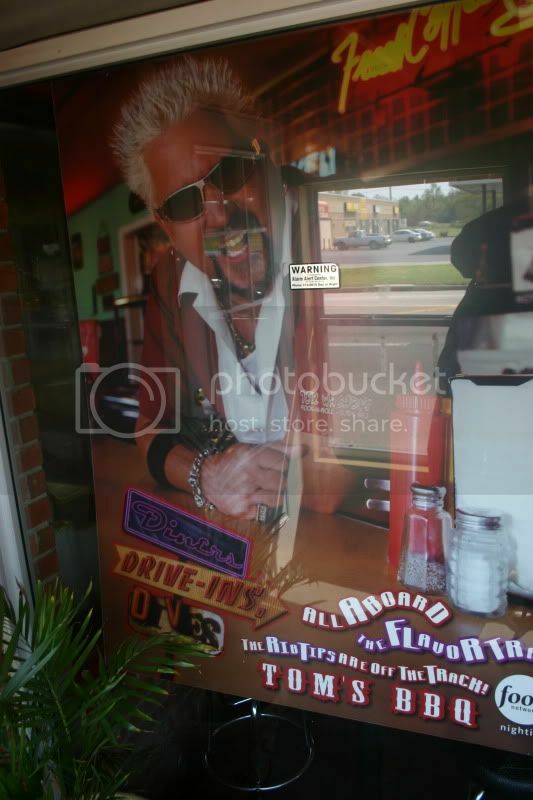 Tom's was featured on Diners, Drive-Ins and Dives a few years ago, and they are not shy about it - I counted at least four posters featuring Guy Fieri's smiling mug. One other thing: I think this is the first barbecue restaurant I've seen that makes a point of saying that "se habla español". And indeed there were quite a few Hispanic diners at Tom's. Tom's barbecue sandwich comes dressed in the Memphis style with barbecue sauce and slaw (interestingly, slaw is below the meat). They obviously went kind of overboard on the sauce. But one bite of this sandwich, and I knew I wasn't in Nashville anymore. The chopped pork on this sandwich was exquisite. The flavor was spot-on - nicely seasoned, and with the right amount of hickory smoke. And the texture was even better - lots of those crispy bark pieces that I love mixed in amongst the tender, juicy pork shoulder - great textural contrast. And though the sandwich was oversauced, the sauce and the slaw were a nice complement to the meat. My only complaint is that the bun was cold and didn't seem very fresh. Still, this was the best thing I had on this trip. In the rib department, Tom's offers both spares and baby backs; I went with the spares. 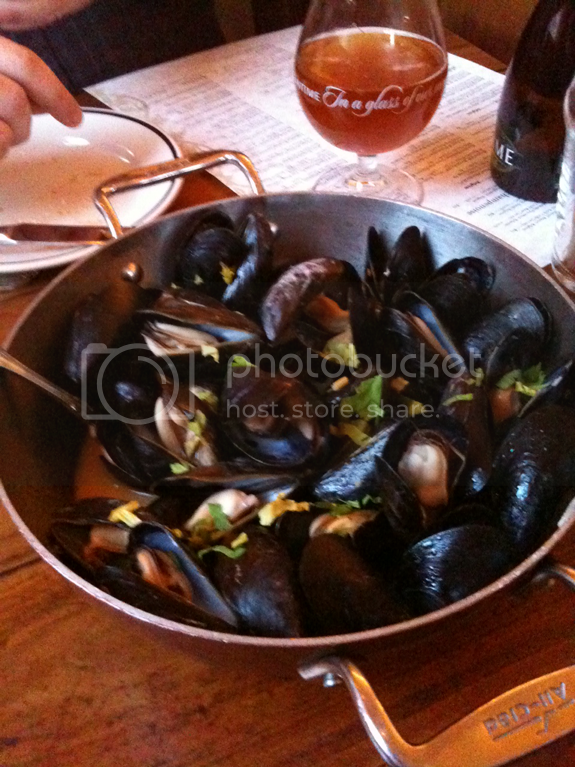 These were relatively simply prepared - unsauced and seasoned simply but effectively. In my experience, this is not the norm in Memphis, where ribs normally come either "dry" with ample amount of rub applied or "wet" with sauce. I enjoyed these ribs, though. 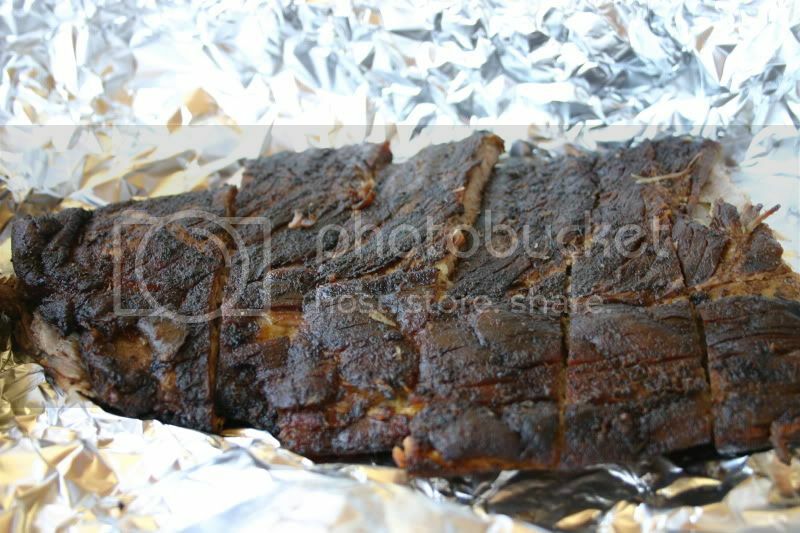 Like the pork on the sandwich, the ribs had a nice subtle hickory smoke flavor. 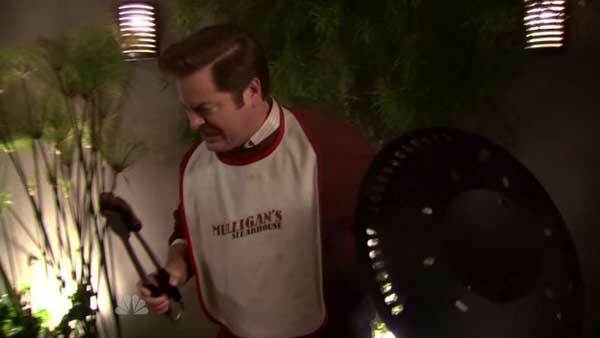 They were cooked nearly to falling-off-the-bone tenderness. 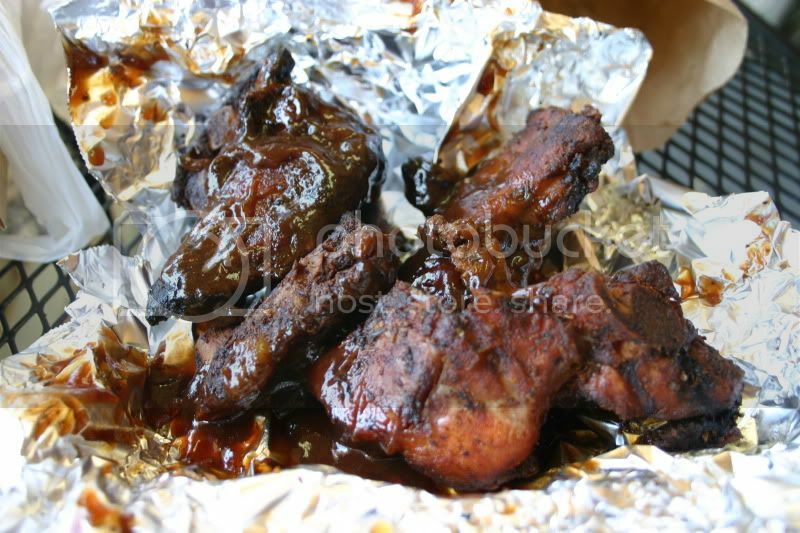 Tom's is best known for their rib tips (pictured at the top of this report). Rib tips are kind of a scrap cut, trimmed from the spare rib. But like burnt ends, some people consider them a delicacy. I found these to be disappointing. Unlike the other meat I tried at Tom's, the rib tips were excessively dry. They seem to have had a healthy dose of both rub and sauce applied, but still, these did not do it for me. Overall, by Memphis standards, Tom's is pretty good. Which means just about anywhere else in America, it would be the best in town. Next up was Leonard's, a place of some historical significance in the realm of Memphis barbecue. It started as a lunch counter in 1922, but its most famous incarnation was as a rambunctious drive-in in South Memphis, with Elvis supposedly being a regular customer (note: if all claims are to be believed, Elvis was a regular customer just about everywhere in Memphis). In 1987, Leonard's pulled up stakes and moved out to the suburbs near Germantown. Obviously, a lot of people come to eat at Leonard's, although when I was there at lunchtime on a beautiful Saturday, the place was suspiciously empty. 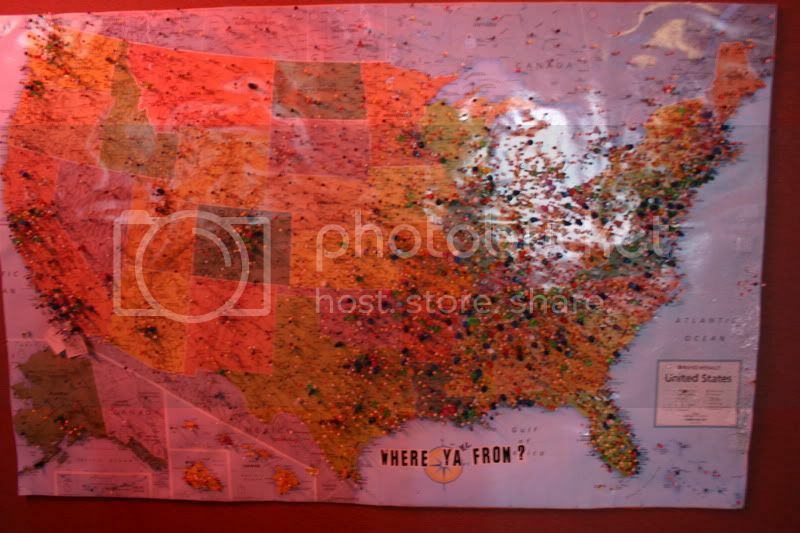 One would think that if the location was, say, downtown in the tourist zone and not well off the beaten path, this place, with its history and charm, could do gangbusters buisness, get on the mail-order gravy train, etc. 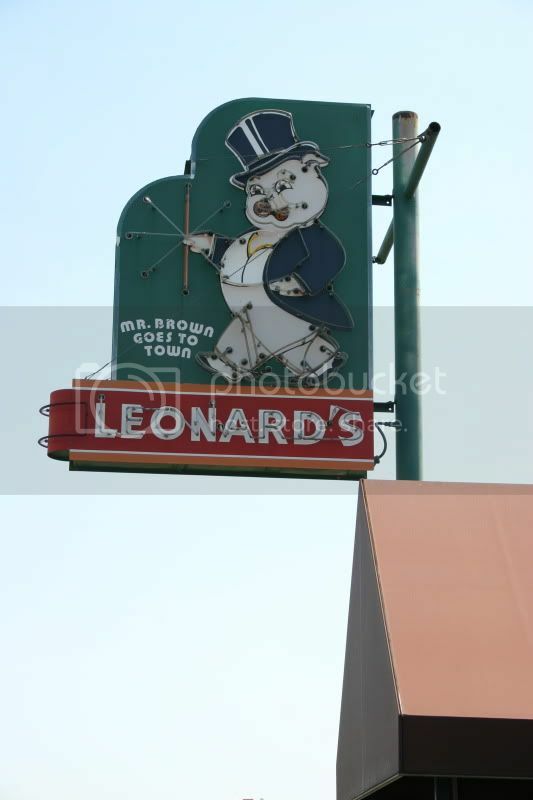 Leonard's claims to have invented the Memphis-style barbecue sandwich - i.e. 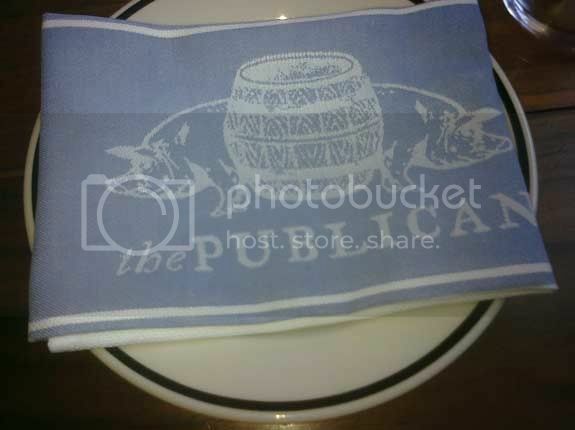 they claim they were the first to serve a pork shoulder sandwich with barbecue sauce and slaw on it. Nowadays, they call it the Big Leonard. I apologize for the blurry photo, by the way - no natural light to speak of. 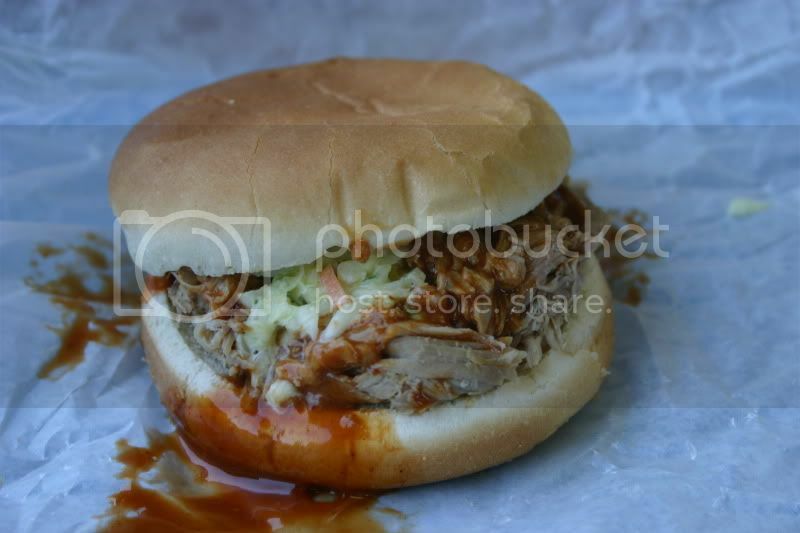 The sandwich looks great - lots of meat, creamy slaw melting into the hot barbecue sauce. 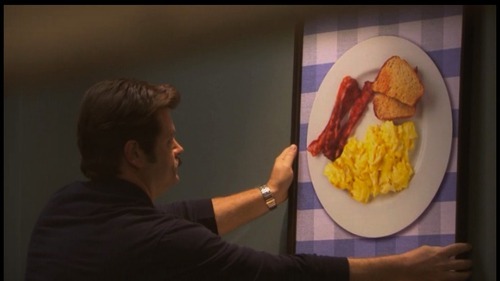 But in terms of taste, I was disappointed. 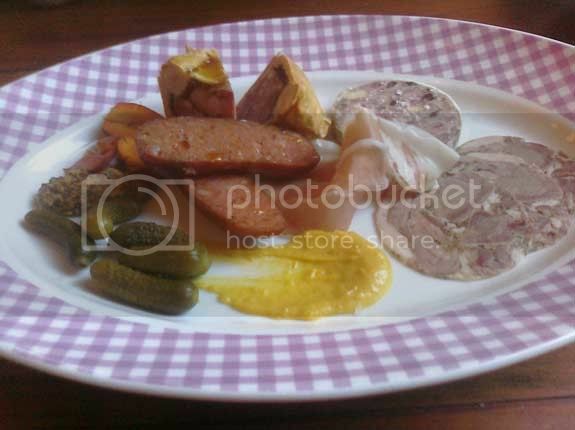 While the accoutrements were great, I found the pork to be dry and especially bland. 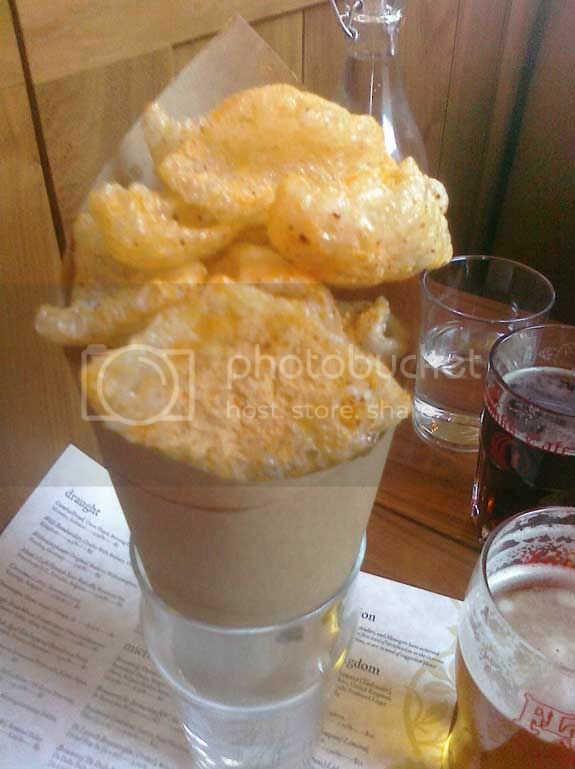 Texture was great, with lots of crispy bark pieces, and I appreciated the grilled bun, but the flavor was just not there. After going back and watching the Diners, Drive-Ins and Dives feature on Leonard's, I realize that maybe it's because they don't season the pork shoulders at all! 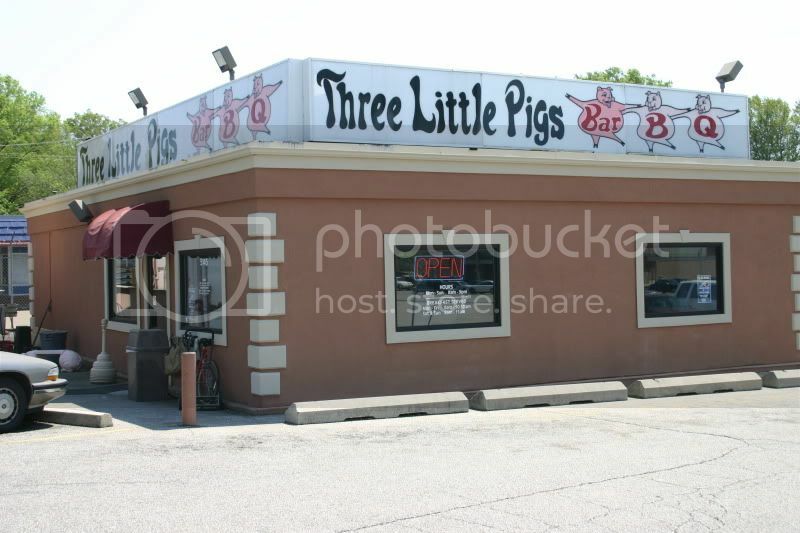 The final stop in this report was Three Little Pigs Bar-B-Q. This is a smaller, kind of neighborhood place, next door to a bowling alley. It's a charming little place with pig decorations everywhere that customers have brought in. 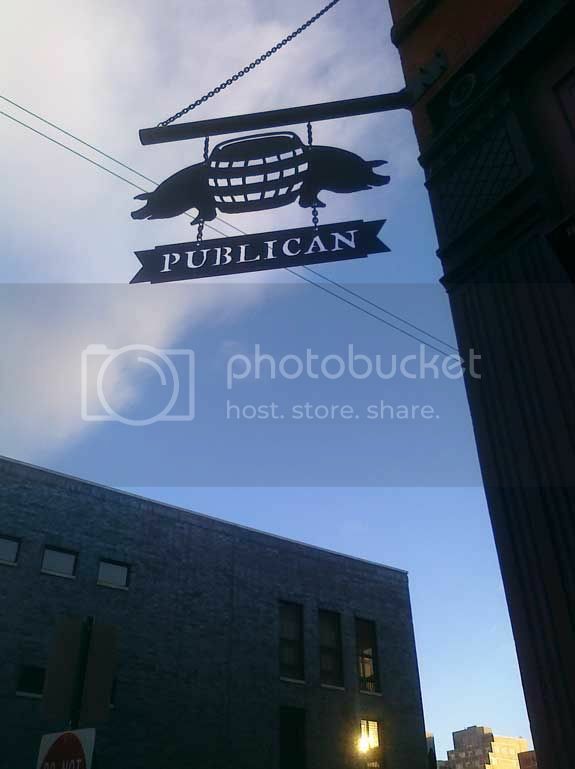 They only serve pork shoulder - no ribs, no chicken. The sandwich was basic, served with a moderate amount of sauce and slaw. The pork was not chopped as fine as most, giving it an almost pulled pork consistency. 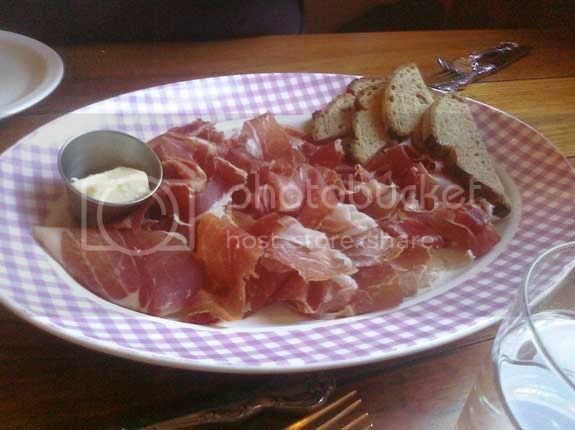 There were few few bark pieces included, so the meat lacked any real textural contrast. 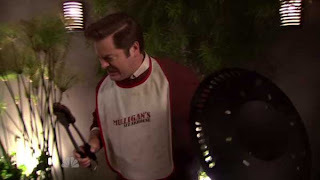 It had great flavor, though - smokey and rich. And the bun was grilled, which was a plus. 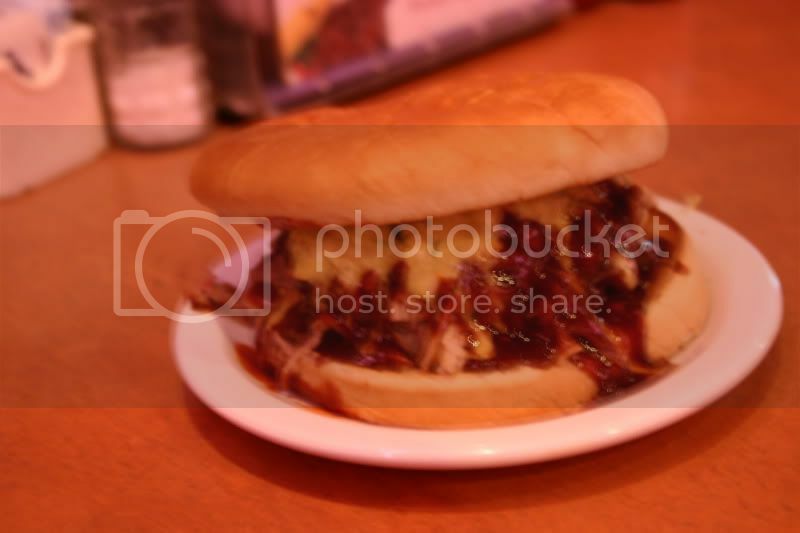 Overall, a pretty good barbecue sandwich. So that concludes our tour for this time. 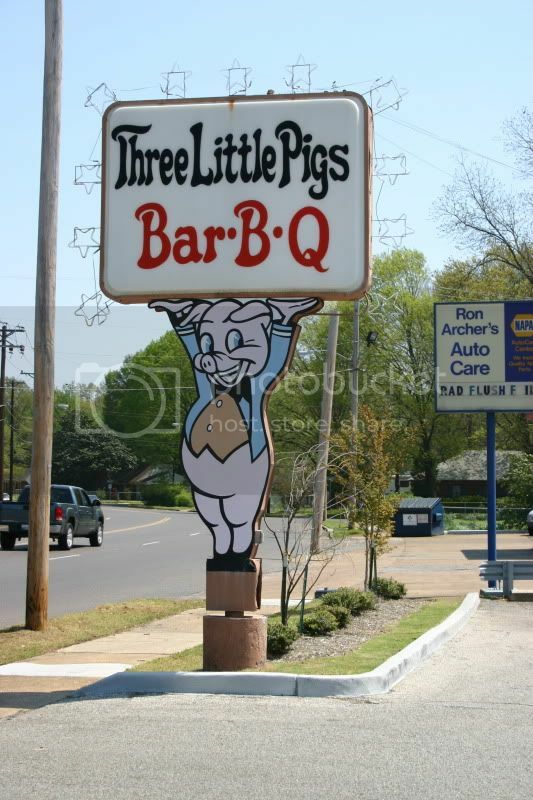 There are certainly many more barbecue places in Memphis to explore, and I hope to get back here as soon as I can!